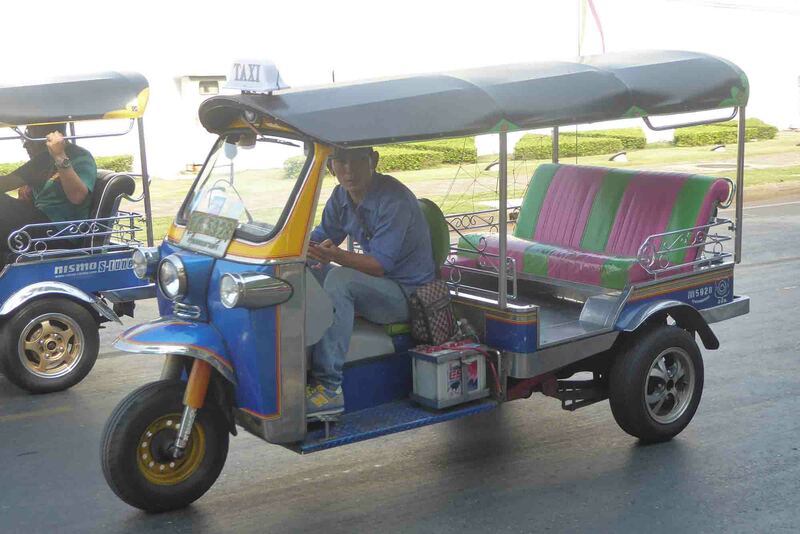 The Tuk-Tuk is a worldwide recognized symbol of Thailand with its distinctive design and sound. If you’re a first-time visitor then it’s a must do to take a spin in one even though you’re breathing in traffic fumes, they’re unstable and you’re probably being overcharged. Agree on a price before you get in and make sure the driver understands the destination. It’s usually best to hail a passing one on the street and not parked in a tourist area like Khaosan Road. 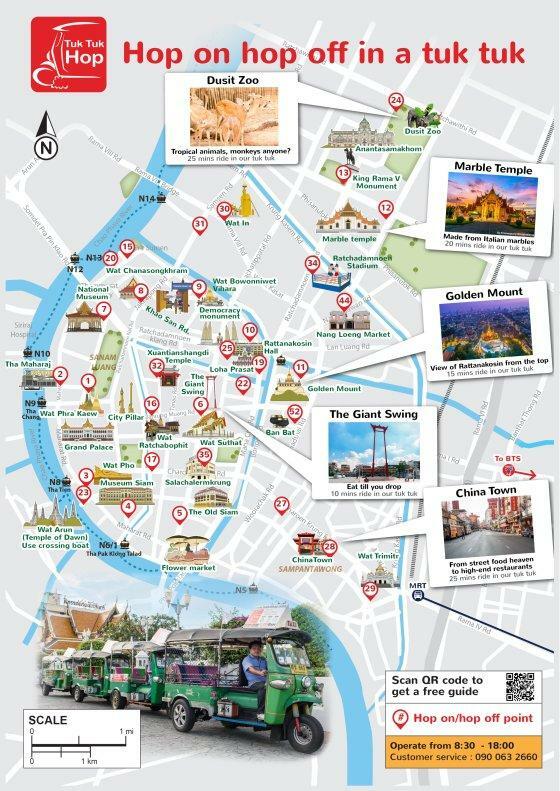 There are no set fares but you shouldn’t really pay more than 60-100 baht to take a short trip such as from Khaosan Road to the Grand Palace, Wat Pho or destinations around Rattanakosin. However, in reality, you’re more likely to end up paying 200 baht to go anywhere. As a general guide try to agree on half of the price that a driver quotes you. If there is a group of you it can be quite reasonable if you’re splitting the fare between you. Tuk-Tuk drivers take part in many of Bangkok’s tourist scams. You should resist any offers of free or cheap tours because this will involve you being taken to dodgy gem or tailor’s shops. The price quoted is usually 60 baht for a city tour which will probably involve a promised trip to see the Big Buddha. The tour includes shopping stops where drivers receive a commission if you buy anything. If you don’t buy the driver will dump you and drive off. The worst drivers tend to hang around Khaosan Road, the Grand Palace & Wat Pho. A Metered Taxi is cheaper, cooler and safer than a Tuk Tuk. If exploring the Old City Rattanakosin area or staying around Khaosan Road, there is good news on the Tuk-Tuk front. A new private hop on – hop off tuk-tuk on-demand service is offering an unlimited ride ticket operating between 08.30-16.00. Its operation area covers Rattanakosin Island, Dusit & Chinatown. It’s run by the same company who run the Chao Phraya Tourist Boat & the Tuk-Tuks are honest. The ticket costs 399 baht and discounts are usually available if you book online. You can buy a joint ticket which includes a discounted day pass for the Chao Phraya Express Tourist Boat (valid 09.00-17.30). Also, you can also book a small group guided tuk-tuk tour which visits several tourist attractions in the old city area. The joint ticket is only available online. To use Tuk-Tuk Hop you will need to download the free app at the play/apple store. You just call a tuk-tuk via the app and wait for it at a selected location. The only downside is the amount of time you may need to wait for a pick-up. You can book for 15 minutes in advance. If you don’t have WIFI on your phone they can also sell you a sim card & 24-hour WIFI package for 49 baht. 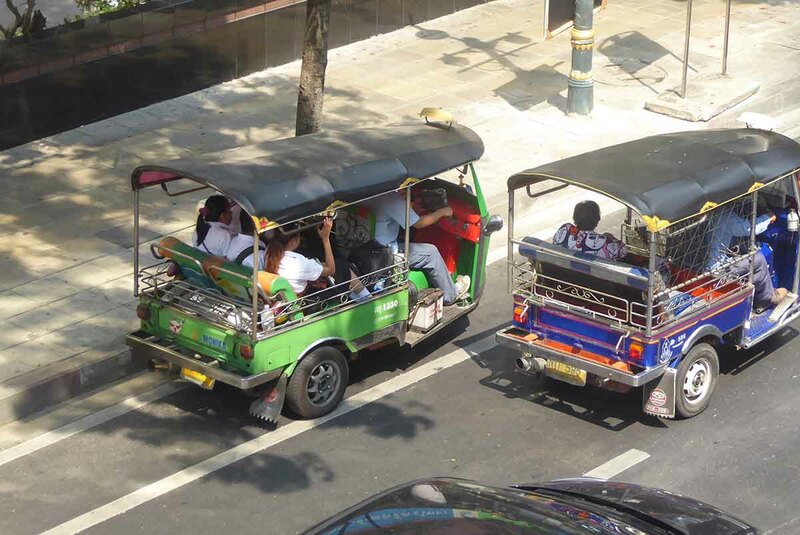 Touring Bangkok on an organized guided Tuk-Tuk tour is a good choice if you don’t want the hassle of doing it yourself. Tours are available day & at night.